This evening I made Stuffed Beef Cannelloni for dinner. To get a head start on it, I browned the ground beef last night and simmered and reduced the sauce to make a thick meaty ragout filling (reducing until almost all of the liquid was gone so the filling isn't wet). I used my tortilla/noodle recipe to make crepe style cannelloni. These can easily be made in advance and don't take very long to make. 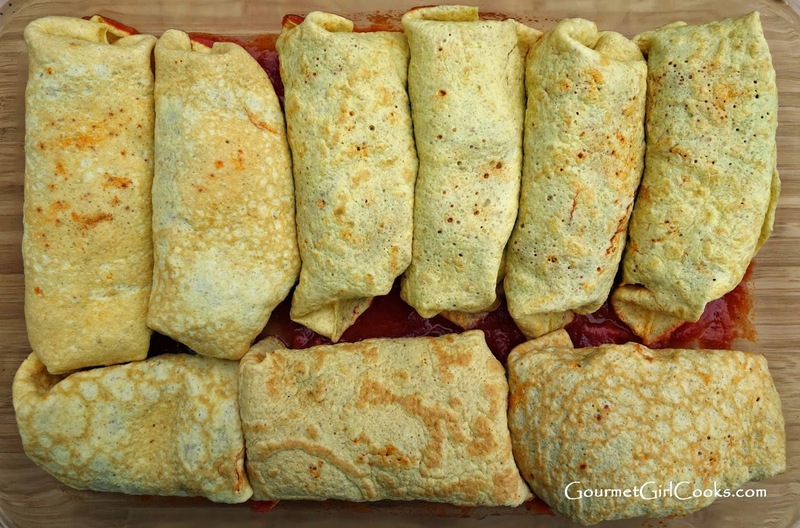 If making this for a weeknight meal, it would be a great time saver to make the crepes in advance and refrigerate until ready to use. I had originally planned to make my own sauce for the ragout but to save time, used a good no sugar jarred sauce instead (my favorites are Rao's, DelGrosso, and Mezzetta). 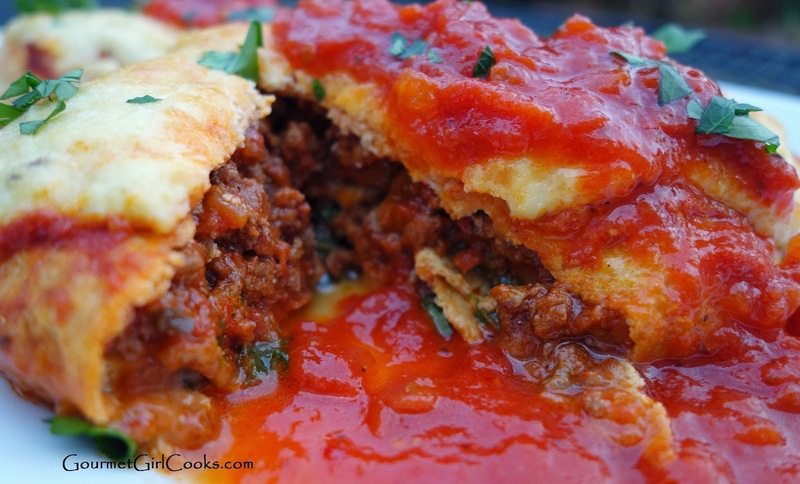 If you make the cannelloni (tortilla/crepes) ahead of time as well as the thick meat filling/ragout, this meal is a snap to put together on a work night and just pop in the oven. 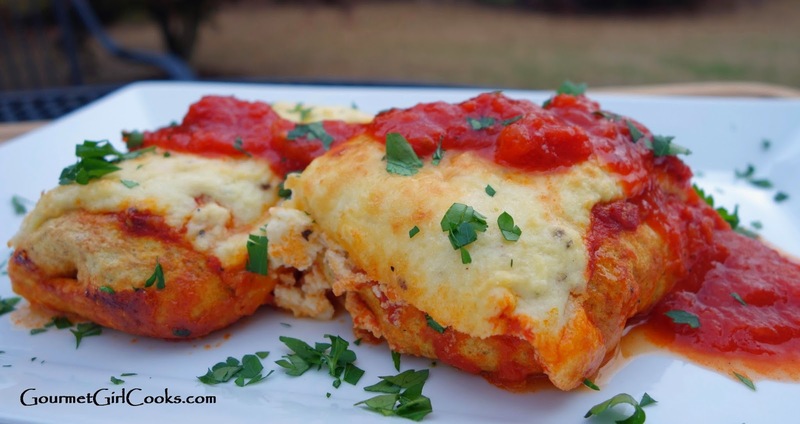 This dish consists of a thick meaty ragout filling with spinach and mozzarella wrapped up in a crepe-like bundle. It's topped with a light layer of pasta sauce and then a final layer of bechamel sauce (white sauce). It turned out great. I snapped a few photos for you to see below. Enjoy! Preheat oven to 350 degrees F. Lightly spray or oil a 9" x 13" shallow casserole or baking dish with olive oil. In a medium stockpot, cook ground beef over medium high heat, breaking it up and crumbling into small pieces with a large spoon or spatula until browned. Add 2-1/2 cups pasta sauce and simmer uncovered until sauce is reduced and meat sauce is thickened, about 30 minutes, until most of the liquid is evaporated. Set aside to cool for about 15 minutes. Stir in mozzarella cheese. While meat sauce is cooling, prepare bechamel sauce. In a medium bowl, whisk ricotta, eggs, 1/2 cup Parmesan, and nutmeg together until smooth and well blended. Spread a thin layer of pasta sauce (about 1/2 cup) in bottom of casserole dish. Divide and place about 1/3 cup thick meat sauce in center of each tortilla/crepe. Top with about 1 tablespoon of wilted spinach. 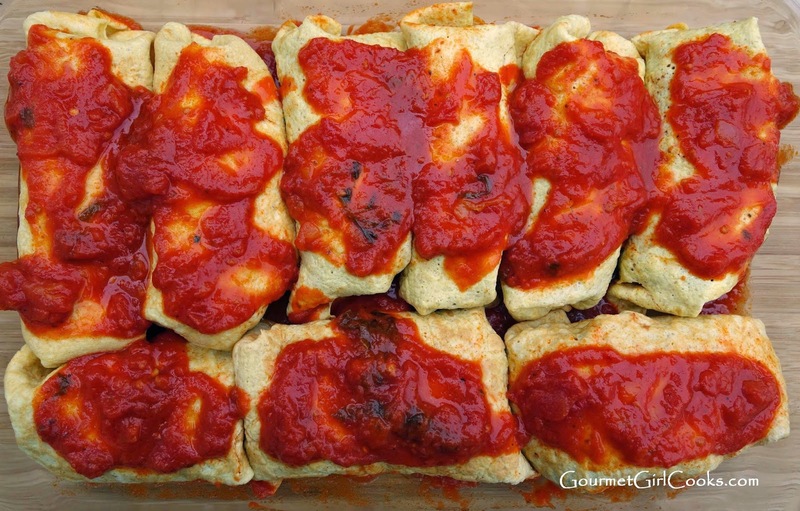 Roll cannelloni up, tucking ends to make a tight bundle. Place seam side down in baking dish. Repeat with remaining cannelloni until casserole dish is filled, tucking snugly together. Spoon a thin layer of pasta sauce over top of cannelloni (about 1 cup). 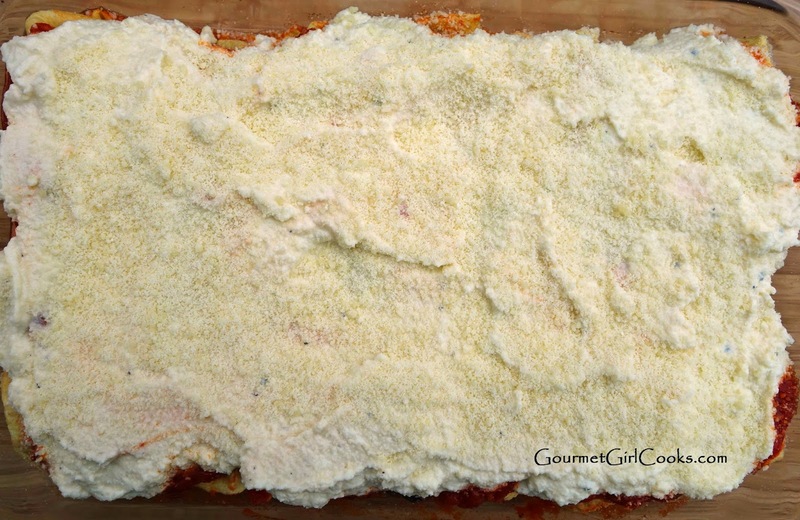 Spread bechamel sauce over top and sprinkle with additional grated Parmesan. Bake for 40-45 minutes, or until bubbly. If additional browning is desired, run under broiler for a few minutes. Let sit about 10 minutes before serving. Top with additional pasta sauce, if desired. Thank you so much for your blog and your wonderful efforts. I just started the Wheat Belly way and use your blog to stay motivated and inspired. You and your husband are the perfect examples of working to stay on the lifestyle and make it fun. Thank you, thank you, thank you....From Ken in North Carolina. 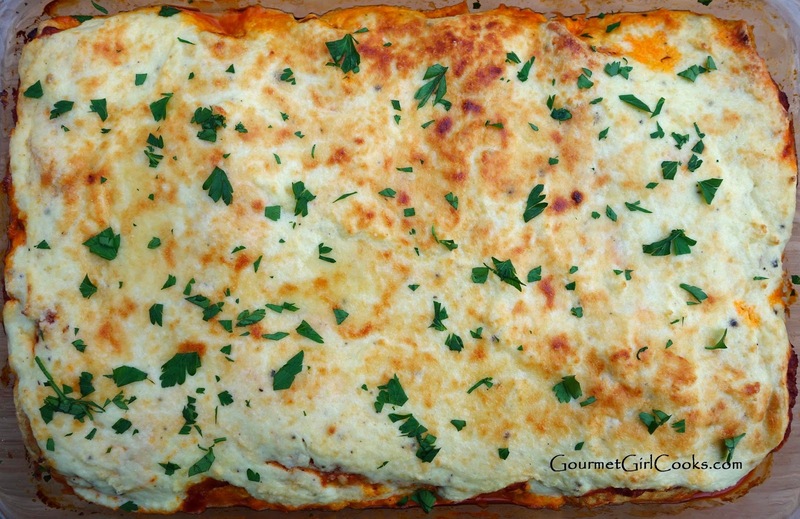 I used to *love* manicotti, which I think is just a tube-shaped pasta form of cannelloni. I also sometimes made it with the large shell pasta for variety. And that reminds me of something else I used to stuff into large pasta ... a "southwest" version with Tex-Mex spicing. Haven't thought about these dishes in a *long* time ... but I sure am now! Thanks for the recipe and the inspiration! Your tortillas/crepes are proving to be very versatile, indeed! Yeah ... you could say crazy weather alright. After the furious rainstorm on Sat. night (some people even had a couple inches of hail, uprooted trees, flying shingles, and power outages) we were windy and 80 degrees yesterday and in the 20's today. We also finally broke our all-time record for the most snow ever in a year. The previous record of 93.6 inches was set in 1880. Last night we got enough snow to put us well over at 94.8! After putting up with all that snow all winter long we figured we may as well break the record while we were at it. It was nip and tuck for a while but when we awoke this a.m. we were happy to learn that the record had been *shattered* during the night! Lots of rush-hour fender-benders on the freeways to put a nice bow on it, too! WOW!!! You have really had crazy weather for sure. I guess if you were going to get that close to the record for snowfall, it's good that you were able to break it. It would be a shame to get that close and not make it.